The Olympics are coming back to North America. It’s 11 years away, mind you, but Los Angeles has been awarded the 2028 Summer Olympics. It will be the first time the Games have been held on this continent since the 2010 Winter Olympics in Vancouver. 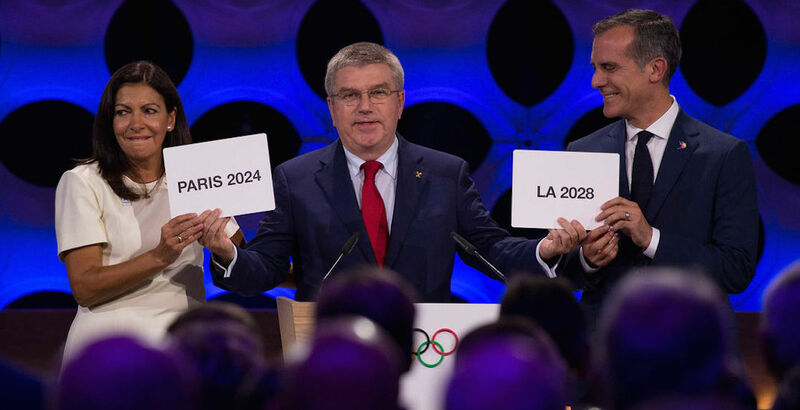 The IOC made the announcement in conjunction with revealing that Paris would receive the Summer Games four years earlier, in 2024. This announcement was void of the usual drama surrounding a bid announcement. No elation from winning from one city. No heartbreak for another. Because of cost concerns to host the Games, three cities (Hamburg, Rome, and Budapest) pulled out of the 2024 bidding process. That left Paris and Los Angeles – two strong contenders – as the only two cities remaining for 2024. To avoid incurring unnecessary costs, a decision was made to award 2024 and 2028 to each city. Paris, a city that had failed three times previously (1992, 2012, and 2016) to secure the Games, will get it first. It’s the third time the French capital has hosted the Games, but will be the first in a century, as Paris hosted in 1900 and 1924. Los Angeles will also host for a third time, having held the Summer Olympics in 1932 and 1984. PyeongChang, Korea will host the next Olympics in five months time. The Olympics will remain in Asia for the next two Games in Tokyo (2020) and Beijing (2022), before Paris gets its turn.